I often talk about tattoo regret and how important it is to get the tattoo that will provide you with the least amount of grief. I’ve seen some especially regretful tattoos recently, like the teenager in Norway who got his McDonald’s receipt inked on to his forearm, or the one of the baby’s hand holding the mother’s finger , but at the very least, these tattoos are nothing that a bit of covering up or lasering off can’t handle. Sure, these are the types of tattoos that will most likely cause their owners more general discomfort than the actual tattooing process itself did, but when all is said and done, the process to get rid of these tattoos wouldn’t be too problematic. What definitely would be problematic is spending years and mass quantities of money covering your body with tattoos, only to realise that you no longer wanted the tattoos. And because of this, you were prepared to spend even more money yet on having every last tattoo lasered off. And then! You wanted to re-tattoo your entire body. Yes indeed, that would be problematic. It’s also exactly what Britain’s most tattooed man, King Body Art The Extreme Ink-Ite (yes, that’s his legally certified name) AKA The King of Inkland, is in the process of doing. 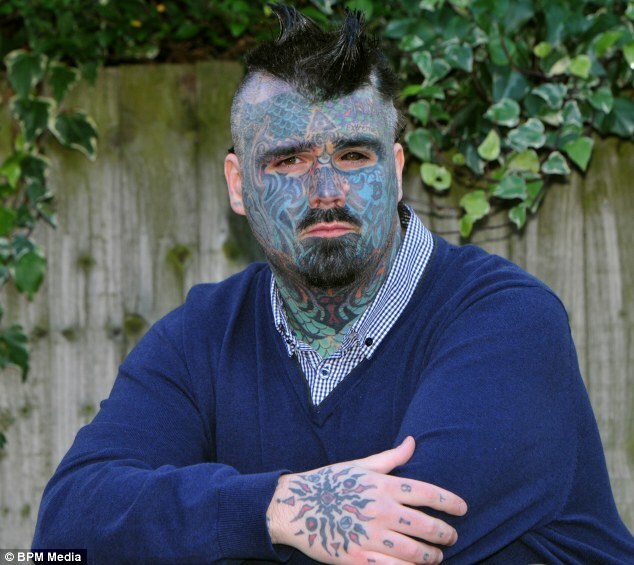 King Body Art The Extreme Ink-Ite (KBATEII) has spent £30,000 ($49,915USD) on tattoos since the age of sixteen (he’s now 34). His entire body is covered in tattoos, yet despite this, he has begun the undoubtedly lengthy and painful process of having said tattoos removed. He has set aside £6,000 ($9,983USD) for laser treatments and is already looking forward to getting started on re-building his body art from scratch. ”I think of myself like an art gallery. After a while the art gets old and people want to see something new and that’s how I feel about my tattoos,’ he said. The King of Inkland has now started planning his next set of tattoos which he is anxious to get in place of the ones he has removed. ‘Some of my friends think I’m bonkers, and it might seem odd to some people but to me I am a living canvas,’ he said. On the one hand, I see his point about being a “living canvas” – it’s kind of cool to think that there is a person who changes tattoos and will have different sets of tattoos as time passes. That’s my objective view, anyway. My slightly more practical view wonders to what degree KBATEII is simply trying to gain media attention for himself. I mean, really – getting rid of all your tattoos so that you can do it all over again? That’s a bit much. I’m sure he’s having a great time and I’m glad that he’s fortunate enough to even be in a position to afford the cost of getting all his tattoos removed and redone. But let’s be honest. It’s a bit of a publicity stunt, isn’t it?